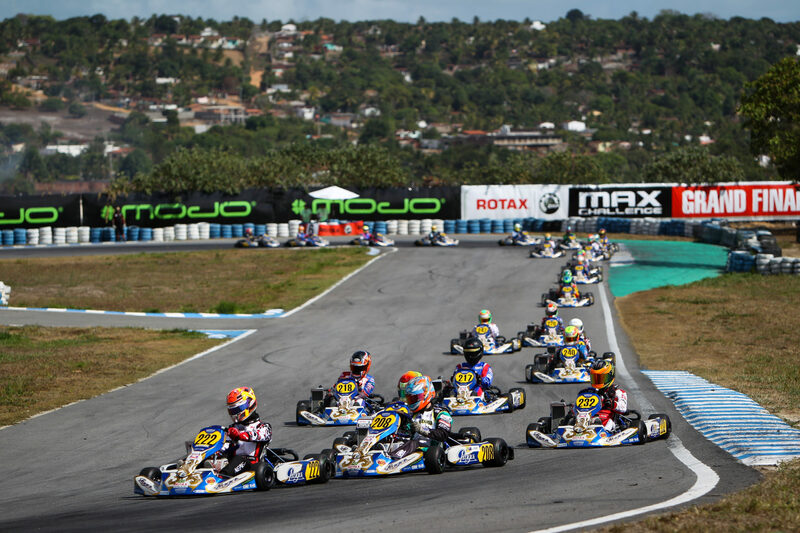 Day 5 of the Rotax MAX Challenge Grand Finals is already wrapped up on the Circuito Internacional Paladino in Brazil. Again, the sun welcomed the drivers and teams as the gates opened early on Thursday morning. A warm 31 degrees and slightly less cloud that had been present all week filled all with optimism that the day wouldn’t be affected by any rain showers. An 8-minute Warm-Up was followed by Heats 2 and 3 for each group in every class and a chance to not only prove their speed but to improve or guarantee their starting position for the all-important Prefinals that take place this Friday. The Warm-up sessions were run with the racing tires on, so strategy is once again important and vital to success over a long week. Whilst drivers want to do further testing and maybe test chassis set-up changes, they also don’t want to do too many laps not to ruin their tires before heading for proper racing. Heat 2 – The Dutch Champion and pole starter, Mitchell Van Dijk dropped down to 4th at the start of the second heat allowing Maksymilian Obst to pull out a lead for the first half of the race. However, Dijk fought hard and battled his way back to take the win over Obst and yesterday’s heat winner Douwe Dedecker. Heat 2 – The second heat for Mini MAX was dominated by two drivers from the outset. By the time the field got around to the third corner on lap 1, Evan Giltaire (FRA) and the oldest driver in the class, Iakov Sokolov (RUS), had broken away from the pack. Tomass Stolcermanis took chase but couldn’t make any impact on the pair and came home in 3rd behind Sokolov with Giltaire taking the win. Heat 2: A+C – Pole sitter and yesterday’s Heat 1 winner, Jaiden Pope, lost the lead which meant Thomas Nepveu from Canada lead most of the laps until a last-lap move by Pope that resulted in Victor Frost Bay coming through from 3rd position to take the win. This dropped Nepveu back to 3rd over the line whilst Jaiden stayed in 2nd. Heat 2: B+D – William Seal from Australia lead the field around on the first lap with Mads Riis close behind. The Danish driver made his move on lap 3 and didn’t look back making it two wins out of two for Team Denmark in the Junior Category. A six-kart battle for 2nd and 3rd spots then ensued with Robert De Haan taking 2nd and the Belgium Kobe Pauwels having a great drive making up nine places to claim 3rd. Heat 3: A+D – The Juniors came back out on track after the lunch break and Robert De Haan was able to improve on his two 2nd places in his previous heats to take the win. Jaiden Pope also now has the same results as he finished 2nd ahead of Thomas Nepveu from Canada. Heat 3: B+C – Mexican Noel Leon was able to secure his second heat win of the event in his last heat finishing 0.299 seconds ahead of Lewis Gilbert from the UK and Vigor Hjorvard from Sweden. Heat 2: A+C – Hannes Morin took the lead at the start and was able to capitalize on a big battle behind him to pull out of a gap that was already 1.7 seconds by lap 2. Rhys Hunter from the UK and Manaf Hijjawi swapped places for 2nd before Hunter was able to pull away and guarantee the runner-up spot in front of the Jordanian driver. The best result for a female driver was Hannah Greenmeier from the USA finishing in 8th. Heat 2: B+D – Another light to flag victory was Petr Bezel in the second of the Senior heats. Szabo Boldizsar had a great race to finish 2nd but almost two seconds behind. Mark Kimber from the UK drove from 10th on the grid to secure 3rd. Heat 3: A+D – The first driver to win all three of his heats in the class was Hannes Morin from Sweden. He led Senna Van Walstijn over the line who needed a good result after a bad heat yesterday. Belgium’s Mick Nolten started and finished in 3rd 0.802 off the front. 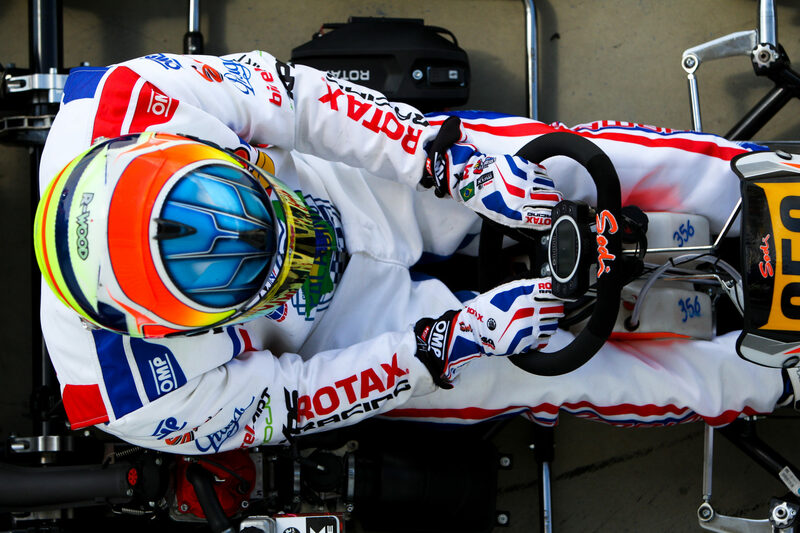 Heat 3: B+C – History was made when Manaf Hijjawi was the first driver from Jordan to win a race at the Grand Finals. Another that impressed in this heat was Zac Stitchbury from New Zealand who moved up five places to bank a crucial 2nd position. They both led home Poleman Petr Bezel. Heat 2: A+C – Four-time Grand Finals Champion, Christiano Morgardo, was back where he belonged when he won the first heat race today for DD2 Masters from New Zealand’s Fraser Hart, who now had two 2nd place-finishes to his name. Home advantage went to Lucas Zacante Souza as he moved up an impressive six places to take 3rd. Heat 2: B+D – The fastest lap time of the week (52.215) so far and the win of the second heat for his group went to Matt Hamilton (NZ). Although the gap was a large one over the line, Austrian Robert Pesevski was also very fast (52.375) and showed he can come through traffic after passing both South Africa’s Stephen Michael (3rd) and Jonathan Pieterse (4th) to finish 2nd. Heat 3: A+D – Cristiano Morgado was able to back up his previous win with another as he led an again charging Robert Pesevski. New Zealand’s Fraser Hart put in another solid performance to complete three top 3-finishes in his heats with a 3rd. Heat 3: B+C – Like his equally-experienced counterpart Morgardo, Matthew Hamilton (NZ) was able to claim his second win of the day. However, this will be more vital for him following his bad result in his first heat on Wednesday. The first race of the week to be Red Flagged following an incident, a single file re-start saw Michael Stephen and Antti Ollikainen drive a sensible heat race to finish 2nd and 3rd. Heat 2: A+C – It couldn’t have been closer over the line between Xen De Ruwe and Daniel Formal to make it two heat wins for either driver, but it was the driver racing for Slovenia De Ruwe that got to the line only 0.007 seconds ahead. Jonathan Buxeda from New Zealand improved one position to cross the line in 3rd. Heat 2: B+D – Team USA took a win in the second DD2 heat with Taylor Greenfield beating the Poleman Claudio Pagliarani and Team Australia’s Ryan Wood, who races with a New Zealand licence, secured another 3rd place to match his performance from Wednesday. Heat 3: A+D – Daniel Formal got the second heat win he only just lost out on earlier when he beat Ryan Kennedy (AUS) and Taylor Greenfield (USA) over the line. Heat 3: B+C – Securing three heat wins to get the pole (not accounting for any time penalties) for his Prefinal tomorrow was Xen De Ruwe. The Italian Claudio Pagliarani came 2nd and Ryan Wood eventually finished 3rd after leading the heat for a couple of laps. Qualifying:A new name again was on top when Official Qualifying took place and Lukas Horstmann did a 55.135. The experience of Da Silveira is still in contention though as he will start P2 with Germany’s Lauren Clevert completing the Top 3. 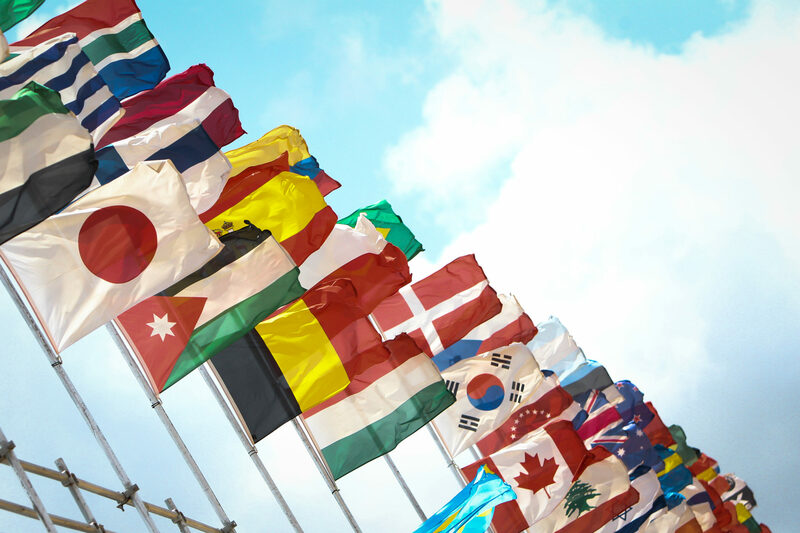 Following this string of Qualifying Heats, drivers and teams are getting ready to enter the next step of these Grand Finals with the Prefinals that are taking place this Friday from 10:06 am (14:06 European central time). 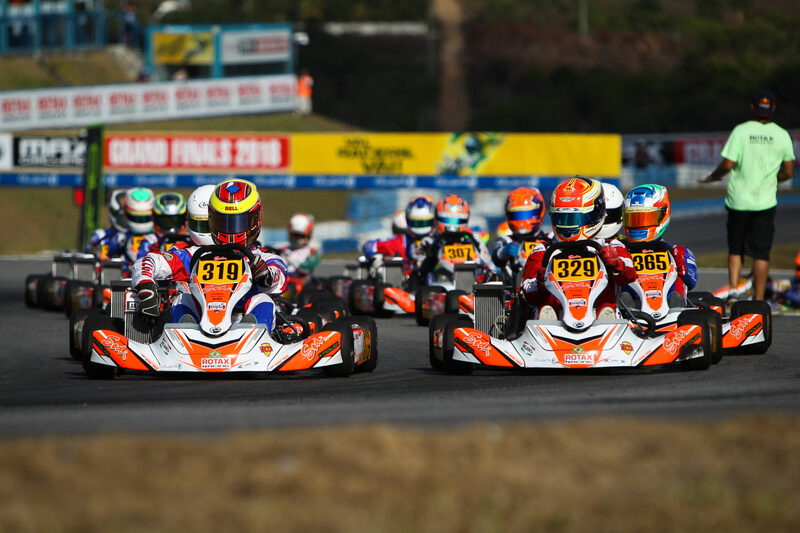 There is still all to be gained or lost as only the top half of drivers in each class will make it through to Saturday’s crucial Finals where the 2018 Rotax MAX Challenge Grand Final Winners will be known.